Hans-Peter Feldmann, Simon Lee Gallery Hong Kong, installation view. Photo courtesy Simon Lee Gallery Hong Kong and the artist. Throughout his career spanning over four decades, German conceptual artist Hans-Peter Feldmann has worked in a multiple of formats, from drawings, sculptures and installations to artistic books and photographic essays, fueled by his avid appetite for collecting everyday images and ephemera. 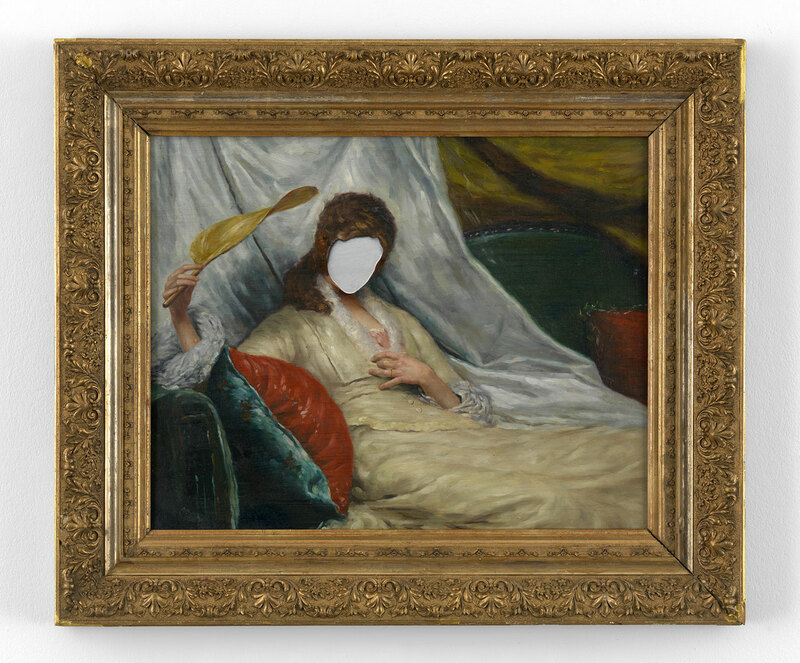 For his latest exhibition in Hong Kong, the Simon Lee Gallery is showcasing a series of 19th century portraits and genre paintings that the artist has found and upended in order to challenge our aesthetic sensibilities. Feldmann's modus operandi as an artist is one of collecting, cataloguing and rearranging images grounded in his appetite for amassing elements of visual culture. As he has characteristically stated: “If there‘s one thing I know how to do, it‘s look”. For him, art is not sacred but rather a form of communication. Therefore images found in books, magazines, family albums or postcards have the same valence to paintings and drawings found in galleries. In the early 1970s, Feldmann earned worldwide acclaim for his encyclopedic photographic series, based on both his own and other people’s photographs, which promoted an archival appreciation of the world around us, such as his 1973 piece “All the Clothes of a Woman” featuring 70 pieces of one woman’s wardrobe photographed one by one. More recent works like “One pound strawberries” from 2004, which depicts the aforementioned quantity by individually photographing each fruit, further demonstrate his conviction that intuitive order and repetition leads to deeper insights. Feldmann’s work has been greatly informed by his life-long fascination for collecting cultural artefacts, from pictures, books and handprints to toys, hats and all kind of bric-a-brac. His contribution in the 2009 Venice Biennale for instance featured a long display of collected toys and figurines that cast uncanny shadows, whereas, for his solo show at the Serpentine Gallery in London in 2012, he purchased several ladies' handbags which he showcased along with their entire contents in museum-like vitrines. Hans-Peter Feldmann, Untitled, Oil on canvas, 80 x 62 cm. Photo courtesy Simon Lee Gallery Hong Kong and the artist. 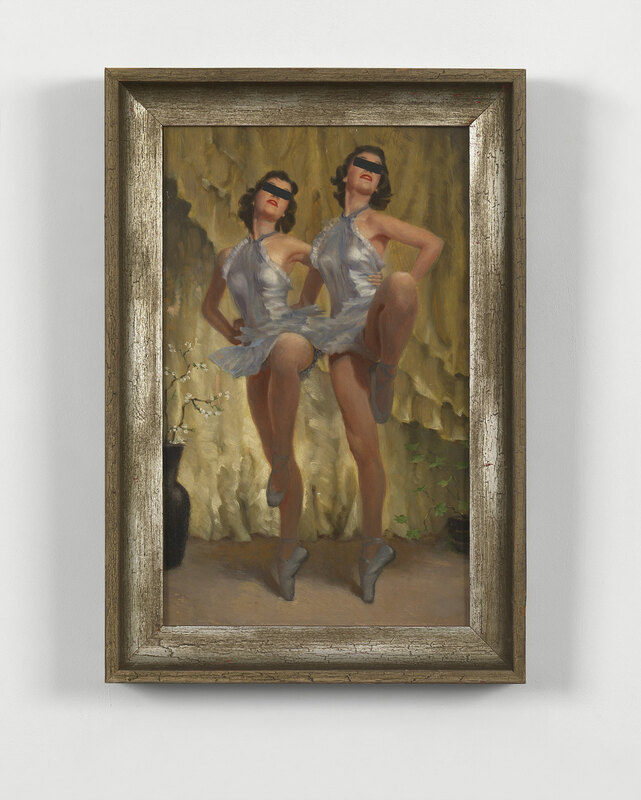 His latest exhibition at the Simon Lee Gallery is also based on sourced material, in this case, 19th century, gilt-framed bourgeois paintings that Feldmann has selected and bought from auctions. Depicting couples, children, pets, soldiers and women, they have been slightly modified with minimal interventions that nevertheless verge on the absurd. Reclining nudes cheekily feature tan lines or redaction blackouts, somber portraits sport clown noses or appear cross-eyed while idyllic nature scenes are missing their central figures who have been cut out. Through these irreverent alterations, the paintings are unchained from their historical and social context, and the concepts they aspire to represent —youth, class, sexuality, war and beauty—are subverted allowing viewers to find new meanings and alternative narratives. As a fervent detractor of the authorship system, this series also sees Feldmann challenge the artist’s role as a unique creator. In fact, Feldmann himself has repudiated the label of artist altogether and, as a co-founder of conceptual art in the 1960s, has pushed to free art from the genius of the artist. True to his beliefs, he has never signed or given his work a title and has tried not to live on it —in the 1990s he and his wife opened a gift & toy shop where he worked full time until his retirement. 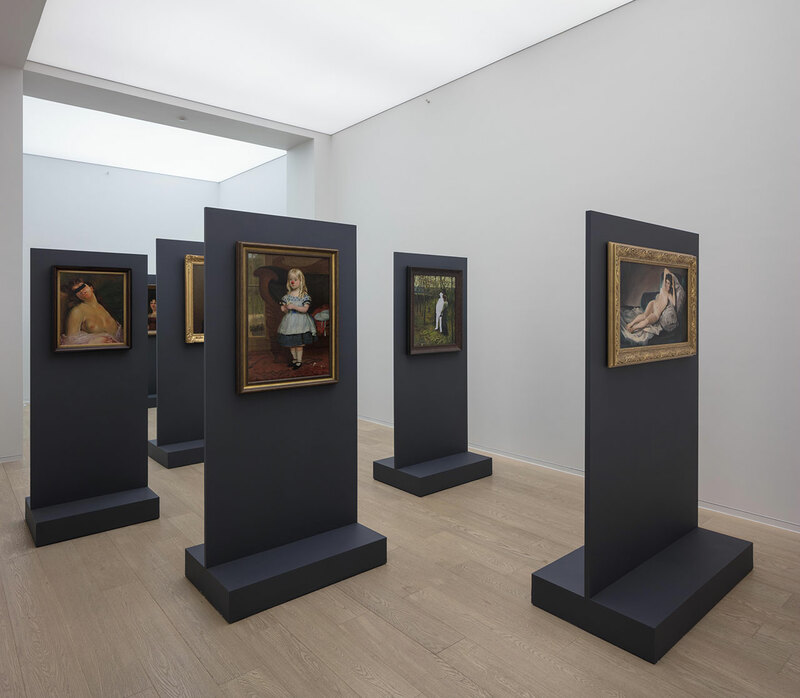 Mounted on custom stands of deep blue color reminiscent of institutional displays such as those at London’s National Gallery, the works not only challenge the viewers’ perception of high art but also that of a museum visit. The uniformity of the display and the repetitive nature of his interventions also invite visitors to view the paintings not merely as individual pictures but as a sequence of interconnected images that speak to our collective consciousness. As Feldmann has stated, “when things are repeated there’s an average value that’s more correct than an individual picture can be”, words for both artists and art lovers to live by. 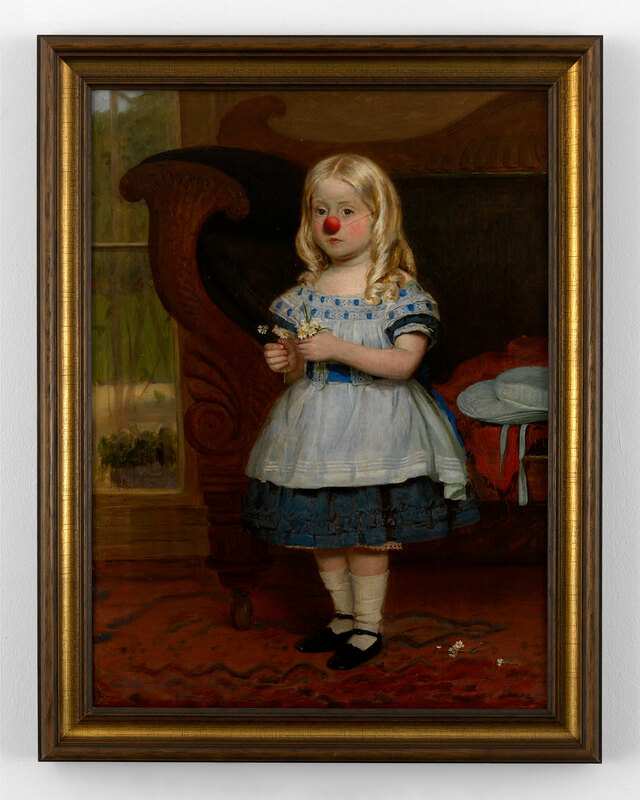 Hans-Peter Feldmann, Untitled, Oil on canvas, 51 x 34 cm. Photo courtesy Simon Lee Gallery Hong Kong and the artist. Hans-Peter Feldmann, Untitled, Oil on canvas, 57 x 68 cm. Photo courtesy Simon Lee Gallery Hong Kong and the artist.